From experience, the following testing cases should be performed to address different payment scenarios. The Blackline eConduit platform removes integrators from PCI PA-DSS scope and EMV certifications, it is not required although recommended to ensure a smooth experience for all clients. It is important that you do not allow users to close the payment window. If a transaction needs to be cancelled, it must be initiated on the terminal itself. If a transaction is sent and the payment window is closed, the transaction is still showing on the terminal and a customer will typically complete it. Depending on the implementation, this can cause the result to be lost in the POS. 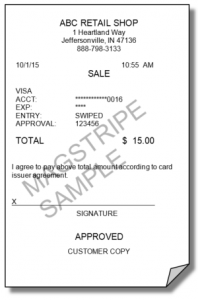 Typically a cashier will then run a second transaction which is now a duplicate payment. Although an amount can be submitted for payment, an approval less than the actual amount can be approved. When pairing devices to cash registers, it is recommended to pair one cash register to one device. Pairing multiple registers to a single device is allowed although it is recommended a second command is held until the device is free. Creating a backlog of commands to the device can create confusion. If loss of connection, the use of CheckStatus should be used. CheckStatus will initiate a search in the device for the results. It is recommended that the same transaction and amount is not allowed a 2nd time prior to initiating a CheckStatus. You should keep calling the checkStatus until the resultFinal field is true. Please see the checkStatus area in red. The following are recommended test cases to complete before going live. 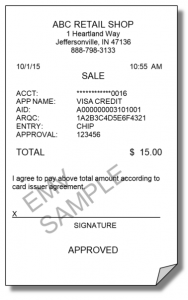 The following are receipt formatting recommendations for standard payments and EMV payments.